Whitley produced one of their best and most disciplined performances of the season with a well deserved victory at second top Marske United. Having won their last six home league games and with the best defensive record in the division, Marske were formidable opponents and Whitley’s task was made all the more difficult as they were without five regular first team players. In addition, Alex Kempster was not considered fit enough to start the game and was named among the substitutes. However, the good news was that Aiden Haley had recovered from injury and there was also a recall for Graham Williams in defence. Both contributed hugely but this was a whole team performance with every player deserving of praise. On a very heavy and difficult playing surface, Marske had the greater share of possession, especially in the first half, but faced by a resolute Bay defence, they struggled to create chances whereas when Whitley broke away, they posed more of a threat. The opening half produced very few shots on target, the first coming after 15 minutes when Matty Cornish played the ball through to Scott Jasper but under pressure from a Marske defender his shot was comfortably blocked by keeper Robert Dean. Peter Glen-Ravenhill also went close while Cornish had a shot saved by the keeper four minutes before the break. Despite much of the game being played in the Bay half, Marske’s only real effort on target came in added time when Peter Bulmer had a long range effort saved by Tom Flynn. After the interval both sides began to show more attacking threat and ex Bay midfielder James Fairley had a shot blocked at the expense of a corner. Whitley responded almost immediately and Marske skipper Adam Wheatley made a crucial interception to deny Kyle Patton a clear run on goal. Alex Kempster who had come off the bench to replace Tom Potter broke away down the left then crossed for Jasper whose header was saved after his first attempt was blocked by Dean. A Marske corner led to a scramble in the goalmouth but the ball was eventually cleared to safety by the Bay defence. This was a rare threat by the hosts who were being thwarted by some timely tackles as Whitley looked to bring the ball out of defence and play it wide as the centre of the pitch cut up badly. Kyle Patton was using his pace down the left to good effect and the Marske defence was starting to get stretched. In the 63rd minute, Cornish was well placed and might have had an attempt on goal but played the ball through to Jasper whose rasping shot was pushed round the post by Dean at full stretch. The Marske keeper then set up an attack for his own side with a long punt downfield. Danny Earl latched onto the ball but Flynn was alert to the threat and came out to push the ball away from goal. The hosts were becoming frustrated as their approach work failed to make inroads against the determined and well organised Bay defence and it was Whitley who eventually broke the deadlock after 72 minutes. Marske defender Lee Brockbank lost possession and Jasper closed in on goal only for Dean to block his shot but the ball fell for Kyle Patton who slotted home the rebound. Retaining their concentration, Whitley rarely looked in danger of losing their lead. Marske substitute Roberts fired over the bar, then a free kick was headed wide, but there was an element of desperation in the home side and Tom Flynn was not seriously tested. Two of Whitley’s substitutes combined to seal victory with four minutes remaining when Callum Patton, making his first appearance since September, cut in from the left brushing off the challenge of defenders who were fearful of conceding a penalty, then with Dean anticipating a cross into the six yard box, Patton attempted a shot from a narrow angle and the ball deflected off the keeper and across goal where the unmarked Alex Kempster drilled it into the net. 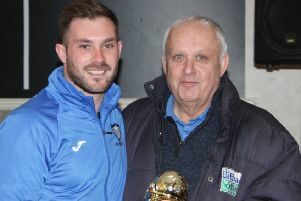 It was his 50th goal for the club - an excellent record for a midfielder – and it was perfect conclusion to a thoroughly impressive Whitley performance. A measure of their achievement was the fact that it was the first time in any game this season that Marske had failed to score.